Brazil win Group A after producing their best performance of the tournament thus far. Luiz Felipe Scolari made one change to his starting line up introducing Hernanes for the injured Paulinho. Brazil stuck with a 4-2-3-1 that saw Fred lead the line ahead of Hulk, Oscar and Neymar. Italy were without Daniele De Rossi and Andrea Pirlo, so Cesare Prandelli was forced to make personnel changes, but he also changed Italy’s shape. The Italians also lined up in a 4-2-3-1 with Mario Balotelli leading the line ahead of Alessandro Diamanti, Claudio Marchisio and Antonio Candreva. Alberto Aquilani partnered Riccardo Montolivo in the double pivot, while Ignazio Abate and Leonardo Bonucci were included in the back four. Brazil was the better side – they defended and attacked as a unit, got into better positions across the pitch and dictated the tempo of the match. Throughout the group stage, Brazil has started games brightly – they would press high, overload wide areas and the fluidity in their intricate passing was mesmerizing. In the opening two games, Neymar scored within 10 minutes, giving Brazil the lead, but their intensity levels dropped severely after. This not only allowed the opposition back into the match, but it left many uncertain as to whether Brazil were reacting to their opposition or content with keeping a compact shape. Surprisingly, Scolari’s men stepped away from that approach and pressed admirably as a unit. Fred and Neymar pressed Bonucci and Giorgio Chiellini on goal kicks and when Italy tried to play out of the back, while the other nine Brazilian players moved forward as a unit to minimize the space between midfield and attack. Brazil’s approach was identical to the Japanese – close down Italy’s deep-lying playmakers and press higher up the pitch when Italy attempts to play from the back. Brazil maintained their pressing for majority of the match, and it prevented the Italians from gaining a rhythm in midfield – ultimately they struggled to dictate the tempo of the match. Prandelli’s men took a cautious approach to the match – they chose to sit back in two banks of four or a 4-5-1, but they kept a relatively high line. It must be said that wingers on both sides were disciplined over the course of the match – Candreva and Diamanti kept Marcelo and Dani Alves from surging forward in the opening 20 minutes, which is vital considering both fullbacks contributed to three of Brazil’s 5 goals prior to kickoff. Italy’s shape was effective, and Abate played a key role to their success. Abate kept Neymar quiet during his time on the pitch – he stayed close to the Barcelona winger when he received the ball, often preventing him from turning and causing havoc with his dazzling runs. Unfortunately for Italy, Neymar’s late challenge on Abate forced the AC Milan fullback to leave the match with an apparent dislocated shoulder. Despite Italy’s organized shape, Brazil was able to create chances due to the intelligence of Oscar and the lack of pressure on Luiz Gustavo. It was a surprise to see Prandelli’s men avoid replicating Mexico’s nearly successful defensive approach – Mexico closed down Gustavo to prevent Brazil from playing out of the back and Scolari’s men were unable to dictate the tempo of the match. Nevertheless, the Bayern Munich midfielder dropped between the centre back to receive the ball and set the tempo of Brazil’s attack. The inclusion of Hernanes also benefitted Scolari’s men because now he possessed two proficient passers in his double pivot. When the Lazio midfielder received the ball, he displayed a wide array of forward and diagonal balls. Brazil was better in possession compared to their first two matches and Hernanes’ inclusion was pivotal. The final key element to Brazil’s superiority in midfield was Oscar. For a 21-year-old that’s played 70+ games for club and country over the last 12 months, it’s quite impressive to see a player play at this level. Oscar completed his defensive duties on both flanks, but when Brazil had possession of the ball, the Chelsea midfielder became a key asset to their attack. Oscar dropped into midfield to help Brazil retain possession, along with finding pockets of space in deeper positions to give Gustavo an additional passing outlet. His positional sense and tactical awareness is rarely praised, but the young Brazilian has played a key role in Brazil’s success thus far. Both managers were forced to make first half substitutions – Prandelli was the unlucky one out of the two, as Montolivo and Abate were unable to continue. Scolari had the luxury of introducing Dante for David Luiz – Luiz was key when Italy occasionally pressed the Brazilian defenders, as he pushed forward to play balls into the midfield. Surprisingly, Dante and Emanuele Giaccherini both scored the opening goals for the respected sides, yet Maggio’s introduction had the biggest impact on the match. It’s peculiar to see a player thrive in a wingback role, yet be so dire as a fullback, but that would be the perfect way to define Maggio. The Napoli wingback isn’t the greatest defender when attackers run at him, and the balance of the match favoured Brazil once the Italian was introduced. Maggio was often dragged out of position, and Neymar was beginning to find space behind the Italian to create. Neymar began to terrorize Maggio down the left flank, and it encouraged Marcelo to be risky and attempt to overload the Italian defender. Neymar scored his third goal of the tournament off a free-kick that was awarded to the Barcelona winger, when Marcelo surged forward and gave the ball to Neymar to run at Maggio. Prior to Maggio’s introduction, Neymar was quiet and Brazil were slightly on top – Abate’s marking on Neymar was pivotal and once he departed, Brazil had more freedom to express themselves down the left flank against a vulnerable Maggio. Italy struggled to move up the pitch as a unit, and Balotelli was isolated for large portions of the match, yet Italy found a way to grab an equalizer. This goal was an interesting feat because of the way Brazil defended Balotelli. Throughout the tournament Balotelli has displayed his ability to hold up the ball and turn his defender on either side. Brazil countered that by sticking tight to the Italian, which always led to a foul. Scolari’s men have been fortunate not to receive more bookings throughout the tournament, as they have committed several cynical fouls. Brazil has made a habit of halting play, seeing as majority of the fouls have been committed when teams are about to break past their first line of press, or when forwards drop deep to receive the ball. Italy’s opener came off a Buffon goal kick, which led to Dante allowing Balotelli to back heel a ball onto the path of Giaccherini and the Juventus midfielder slotted his shot past Julio Cesar. After the goal, Dante was instructed to stick tighter on the Italian forward, which is why Balotelli failed to have a significant impact on the match. Brazil’s pressing has been effective, and they have thrived when dropping off and keeping their shape – but that can be down to their last-ditch tackles that keep teams from attacking open space when Brazil is caught out of position. Neymar’s free kick and a Fred goal courtesy of another direct ball from a Brazilian fullback, gave Scolari’s men a two-goal lead. Brazil suddenly dropped into a narrow 4-1-4-1, which allowed Italy to take control of the game, as Brazil aimed to break on the counter. Chiellini’s controversial goal saw the two managers make their final changes – Stephan El Shaarawy was introduced to attack space behind Dani Alves and prevent the fullback from pushing forward, while Fernando’s introduction meant Brazil became a 4-3-3. Neither substitution had a significant effect on the match and Fred’s 88th minute goal destroyed the possibility of an Italian come back. Brazil produced their best performance of the tournament thus far – they pressed high as a unit to prevent Italy from building plays, the midfield’s movement and ability to find space to receive the ball was superb, while Neymar and Marcelo continue to dazzle on the left flank. Prandelli’s tactical experiments haven’t been a success and his team now faces a semi-final date with Spain. Over the past two matches the Azzuri have struggled severely when teams close down their deep-lying playmaker, which has limited the service Balotelli has received. Defensively the Italians have been poor, conceding eight goals in three games, compared to the seven conceded throughout Euro 2012 – the midfield has been stifled once teams close them down, and Balotelli has often been an isolated figure. With Balotelli and Abate unavailable due to injury, there may be a good chance Italy line up in a 3-5-2 against Spain – reason being they reacted to Spain’s threat magnificently last summer, and it’ll turn Maggio into a threat opposed to a liability at the back. Scolari’s men produced their best performance of the tournament thus far and now await Uruguay in the semi-finals. Brazil’s pressing was delightful, and the intelligence of Oscar also played a key factor. Once again Neymar steals the headlines, scoring another remarkable goal, pushing his tally to three goals in three games. Scolari also benefitted from the inclusion of Hernanes, who helped Brazil retain the ball and dictate possession. Scolari’s men look to be getting it together at the right time, but it’ll be interesting to see whether Hernanes will keep his spot in the line up if Paulinho recovers. Nevertheless, Brazil stuck to the basics and nullified Italy’s strengths, making them worthy winners on the day. A moment of sheer class from Arjen Robben was the difference maker, as Bayern Munich knocked out rivals Borussia Dortmund in the DFB Pokal quarterfinals. Jupp Heynckes opted to set his team up in their traditional 4-2-3-1 with Mario Mandzukic leading the line. 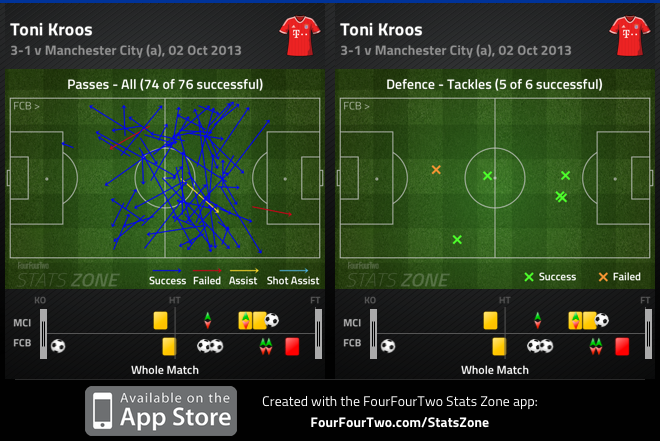 Thomas Muller and Arjen Robben played out wide and Toni Kroos played behind Mandzukic. Heynckes’ midfield consisted of Bastian Schweinsteiger and Javi Martinez. 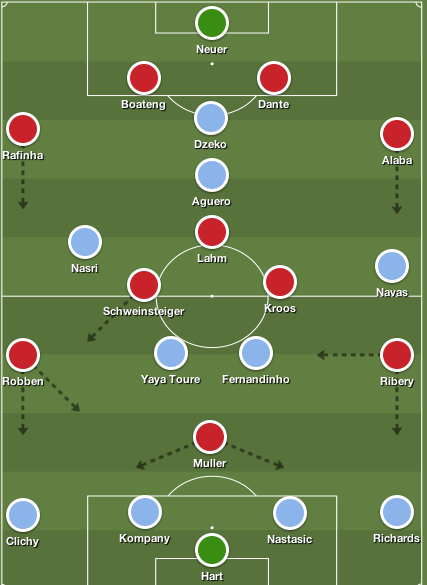 Jurgen Klopp lined his side up in a 4-3-3 with Robert Lewandowski leading the line. Mario Gotze and Marco Reus played out wide, with a midfield trio consisting of Ilkay Gundogan, Kevin Grosskreutz and Sven Bender. With Mats Hummels and Jakub Blaszczykowski missing, it wasn’t much of a surprise to see Klopp add an extra man in the midfield. The start of the game was equivalent to a chess match in terms of pressing. Bayern pressed the Dortmund defenders, forcing either Neven Subotic or Felipe Santana to distribute play from the back. Hummels is far superior to both men in terms of passing and that was where he was missed. Bayern’s pressing led by Mandzukic forced Dortmund to concede possession in their final third several times. Dortmund on the other hand pressed Bayern’s midfield, which forced Schweinsteiger and Martinez to drop deeper than usual to start plays. Brazilian centre back Dante played a significant role when Dortmund pressed, seeing as they allowed him to string passes and get forward. This was significant because although Bayern’s midfield was unable to dictate play initially, Dante played diagonal balls out wide to Muller and Robben. Klopp’s decision to play Gorsskreutz in the midfield was an attempt to stop Bayern from controlling the midfield, especially with Kroos dropping deeper to create 3v2 situations. Although, Kroos didn’t have one of his best games (credit to Bender), as the half wore on Martinez and Schweinsteiger began to grow into the game. With Reus and Gotze higher up the pitch, David Alaba and Phillip Lahm were cautious about going forward, but this left more space for Bayern’s midfield to dominate. As we approached half time Bayern took the lead, courtesy of a glorious Robben finish. Marcel Schmelzer coneceded possession in his own third, and the ball fell to an unmarked Robben. The Dutch international looked up and calmly curled his shot past Roman Weidenfeller. 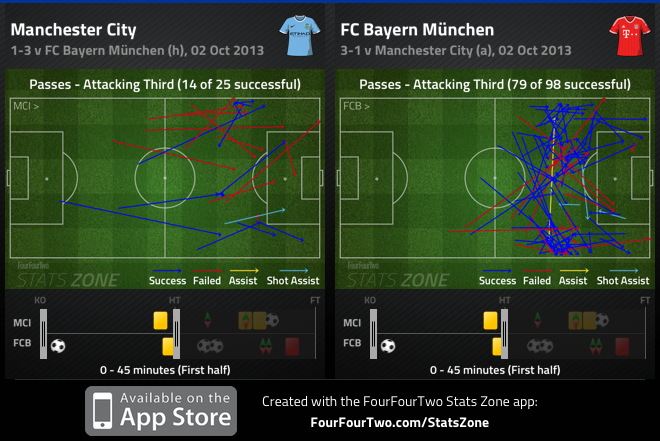 With Dortmund looking to get an equalizer, Bayern opted for a more cautious approach in the second half. Without the ball, they became a 4-4-2, allowing Santana to play balls from the back. It was wise seeing as he isn’t the greatest passer, but Bayern’s cautious approach allowed Gundogan to have a better second half. Gundogan dropped deeper to receive the ball and despite the pressure applied, he was able to pick passes with ease. Dortmund’s midfield along with the introduction of Julian Schieber and Blaszczykowski brought more energy and promise to their attack, but they were unable to make the most of the opportunities presented. It’s also key to note that Weidenfeller was superb on the night, as Bayern had several chances to increase their lead, but the German goalkeeper kept his side in the match. Brazilian defender Dante was instrumental in Bayern’s back line and he nullified Lewandowski for 90 minutes. Not only was he superb defensively, but he came close to scoring as well. It’s hard to remember a game this season where Gotze, Reus and Lewandowski were all ineffective. Despite a better second half, Klopp’s tactical approach to this game was ineffective. It could be down to having a small squad or fatigue, but today’s performance reminded us why Bayern are 17 points clear of their rivals. Along with an inconsistent season, Dortmund has struggled to challenge on three fronts, and this cup exit will surely leave Klopp and his men focused on European glory. The Bavarians have finally conquered Dortmund, defeating them for the first time in their last six attempts. It was a great performance from the league leaders, and it goes to show that their summer acquisitions have paid off. 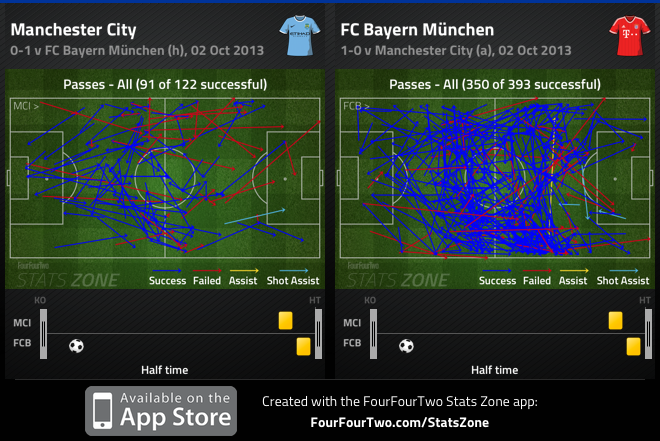 In terms of depth and quality Bayern is the superior side, and their dominant performance today displayed that. This win ensures that Bayern has a legitimate chance of not only winning a league double, but also a potential treble in May.